A former Maxus trader, Maloney hopped swiftly from Essence to Johnny Hornby’s media shop, where clients include Just Eat and Toyota. He is the mastermind of Media Fight Night, the annual industry boxing evening, now in its fourth year, in aid of the Head & Neck Cancer Foundation. As one of the shrewdest buyers in out-of-home, Bryant could play a crucial role in the redrawing of the out-of-home sector after Global’s dramatic triple M&A entry into the market. Talon might not be the biggest but its independence gives it freedom. Bryant plays a long-term game and helped win Havas’ business from Posterscope. Bevan is a former Dentsu trader, who has survived upheaval and risen to become responsible for investment for all Havas UK clients’ media spend. He made the numbers add up when Telefónica consolidated the O2 and Giffgaff accounts. A top media operator who is good with numbers, makes decisions swiftly and "looks up and out of his department" as he focuses on how to make PHD better. Winning HSBC was the highlight of the year for Walsh’s 150-strong investment team. According to one sales chief, Cartwright is a "fantastic trader who works really well with media owners". 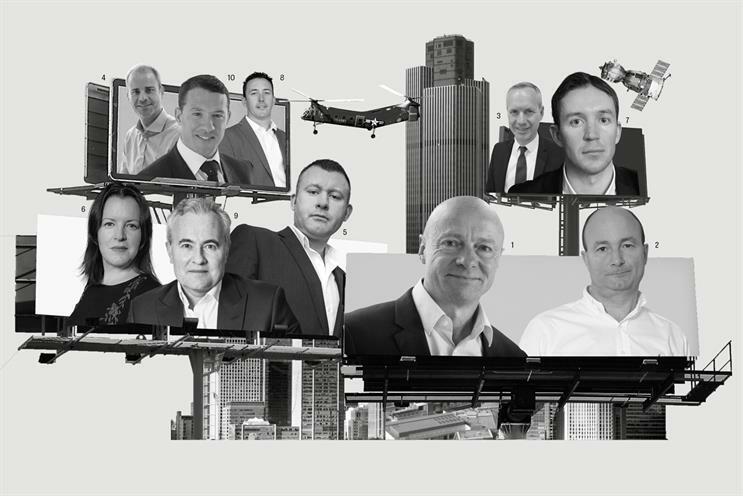 An ex-Maxus buyer, she oversees TV and cinema in her AV role at Dentsu Aegis Network’s trading and innovation arm at a time when her ultimate boss, Matthew Platts, has taken a bigger role as chief commercial officer. Hall is a straight shooter who has had his hands full with big pitches. These have included MediaCom’s Sky and Coca-Cola defences and the Lloyds Banking Group win in a closed review. This year MediaCom also scooped agency of the year at the Media Week Awards. O’Neill is an infl uential backer of The Ozone Project, the joint platform for newspaper brands to sell digital display inventory. He has not been afraid to criticise the technology giants, telling a Newsworks’ audience he is "fed up" with the lack of independent measurement that "suits tech platforms and discriminates against premium environments". Williams is a slick operator who is a more visible presence than his peers at industry events, such as the UK media-owner upfronts. Being part of the big Publicis Media relocation to White City in 2019 is next on the agenda. Overend is "superbly pragmatic" and a master of trading detail, according to a colleague, who relies on him. Landing the UK government’s £150m media buying account, which involved adhering to ISBA’s new, tougher media transparency principles, was an important milestone this year. The top trader at the biggest media buyer has needed his skills during a tough year for parent company WPP and is said to have played a key role when Sky’s £300m review came to the crunch. Collins "is way ahead of the competition, not only because of his encyclopaedic knowledge but also his huge amount of charm", one media owner says. "I wish we had him running the Brexit negotiations."